there are a lot of things from my kitchen that are never shown on this blog. some nights, we have digorno pizza. or freezer chimichangas… pronounced chim-ee-chang-guhs, cause the freezer section makes me feel classy like that. or hot dogs and kraft macaroni and cheese. or leftovers. or tom picks up something on the way home. i truly do enjoy cooking, but sometimes it is nice to just have a break. 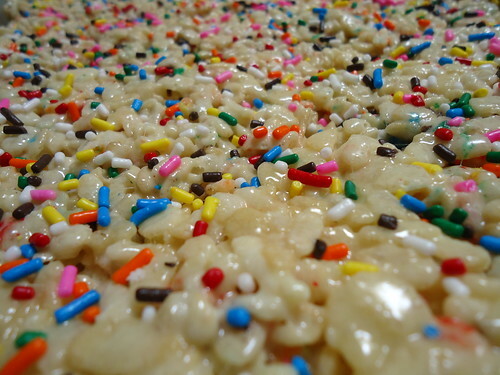 just throw some cake batter mix and sprinkles in regular rice krispies… ok, sounds simple enough. they looked just fine, i really liked how the sprinkles dressed them up. the problem was that they tasted just like plain ol’ rice krispie treats. not a single hint of cake batter in them. at all. reading it up on it (after the fact, per the usual) i found that a lot of people have encountered the same problem with the cake batter recipe trend. the moral of the story: adding cake mix does not make something automatically taste like cake batter. try some baker’s mystery flavor, which adds a true cake flavor. 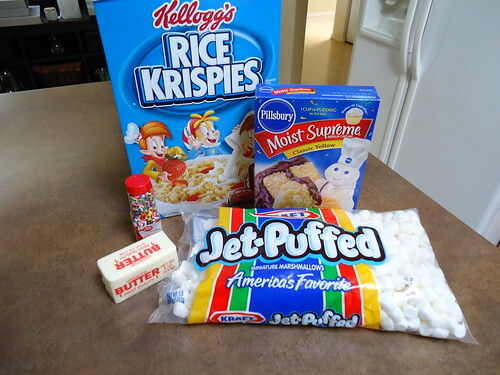 or just stick to making plain and simple rice krispie treats. make them festive with sprinkles, because looking pretty was the only thing to set these treats apart. in a rare moment that tom was watching food network with me, he spotted a christmas yule log and requested that i make it for christmas eve. tom rarely makes a specific request for anything food related, so i was more than happy to oblige. i researched and then chose a recipe from one of my favorite blogs: smitten kitchen, home of my favorite pop-tart recipe. she went into great detail about the recipe and how she had worked on her cake rolling technique. i had no problem with the pumpkin roll i made for halloween and was ready to tackle the yule log, head on. 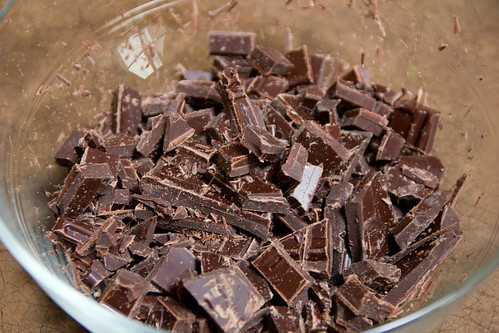 i chopped up the chocolate to melt down for the batter… it was pretty. see? everything seemed to be going according to plan, the cake even looked great when it came out of the oven. it was nice and springy, just as it was described in the recipe. see? 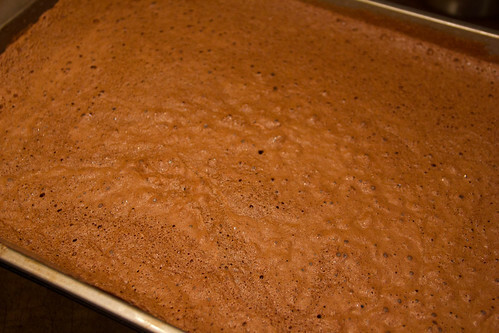 i followed the cooling instructions, covered the cake in cocoa powder and rolled it up. then things went south. after it cooled, i attempted to unroll it and it just came apart. it seemed to have chemically bonded with the tea towel that i used. in an attempt to salvage the roll, i ended up scraping pieces of cake off the towel. the roll just barely came together. i called it rustic, after eating a heaping spoonful of the whipped cream filling. that made things much better. it ended up tasting great, but definitely was not festive or pretty. 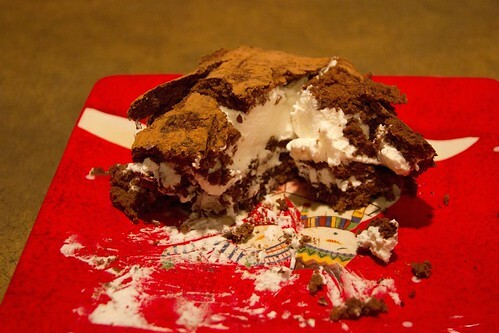 because it had whipped cream in it, that would have surely collapsed by the next morning, we each had a slice. then i gladly threw it away. so there you have it. one recipe that looked pretty and tasted mediocre. another that looked awful and tasted wonderful. just goes to show that things can go downhill when you least expect it. then you try again.